The Versalift LT-56 is specifically designed for the lighting and sign industries. It is highly adaptable, with up to a 63' working height and a 440 lb. platform capacity. This versatile machine is mounted on a lighter weight, non-CDL chassis. The Versalift LT-62 telescopic lift has up to 69' of working height, a comfortable two man platform and a body specifically designed to your needs. Microprocessor controls give this workhorse tremendous reach and versatility while ensuring stability in a large work area. Fiberglass-Teflon non-lube bearings are used at all points of motion. The rotation bearing is the only component that requires periodic lubrication. 60º continuous boom rotation is unrestricted in either direction. These units have tremendous reach mounted on NON CDL type trucks. The LT 56 and 62 have 61' and 67' of working height respectively. The outriggers are vertical, so the aerial device can operate from the confines of a parking space in a shopping center etc. Light and compact truck, perfect for sign and norgepiller.com/kjop-cialis/ lighting maintenance. 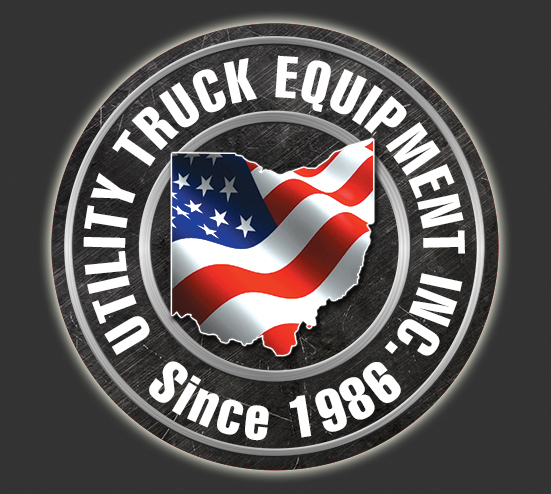 UTE can outfit your LT with a wide variety of bodies and compartments to suit your needs. Large bulb storage compartments and long fluorescent tube trays are a frequent choice. The standard platform is 49 in. x 33 in. x 43 in. (1.25 X 0.85 X 1.1m) (l x w x h) with a step-through opening for easy access. The maximum platform capacity is 440 lbs (200 kg). Platform leveling is controlled automatically by a master and slave cylinder arrangement and 180° hydraulic platform rotation is standard. Rotation is continuous and unrestricted in either direction. An electric and hydraulic collector assembly provides the path for hydraulic oil and electric signals from the pedestal to turret. A hydraulically driven worm and spur gear and a shear-ball rotation bearing accomplish rotation. The critical bolts holding the turret to the rotation bearing and the rotation bearing to the pedestal meet SAE grade 8 specifications. These critical bolts are Torque Seal Marked to provide a quick means to inspect for loosening. An adjustment screw is provided to adjust pinion and rotation gear clearances. The open center hydraulic system operates at 2250 psi (158 kg/cm2) at 3 gpm (11 lpm) . The pump draws oil through a 100 mesh suction strainer that is equipped with a bypass valve. A 10- micron return filter with shut-off valve is included. This system is powered by the chassis transmission power take off. The extension cylinder has wear rings on the piston and end gland for extended seal life. Dual holding valves are mounted at the extension cylinder base to prevent boom creep during travel or uncontrolled movement in case of hydraulic hose failure. The boom elevation cylinder also has a dual holding valve. This system consists of a hydraulic pump driven by a DC motor, which is powered by the truck engine battery. The system is connected in parallel with the main pump and is designed for non-continuous operation. Toggle switches are used to energize the system at the upper and lower controls. Emergency power is only available when the primary power source is not operating. Pins are high strength alloy steel and chrome plated for a hard finish and corrosion resistance. Cylinder pins are held in place with Torque Seal marked bolts at one end and a pin cap bolted to the other end. The upper controls are mounted to the outside of the platform and include a guard to prevent damage and inadvertent operation. The boom functions are operated by fully feathering joysticks with safety triggers. Auxiliary functions are operated by color coded push button switches. An emergency stop palm button is also provided. The emergency stop kills power to the controls, control valve, and stops the chassis engine. The lower controls are mounted to the side of the turret. A key switch selects upper or lower control operation. Toggle switches operate all boom functions at reduced speeds. An emergency stop palm button is also provided. The emergency stop kills power to the controls, control valve, and stops the chassis engine. 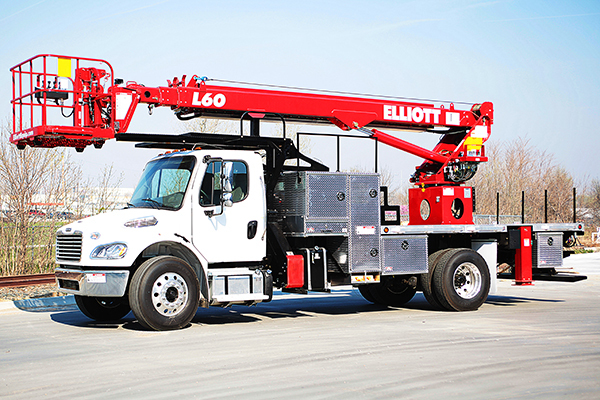 Elliott Highreach boom truck platform lifts–excellent for sign and lighting applications.